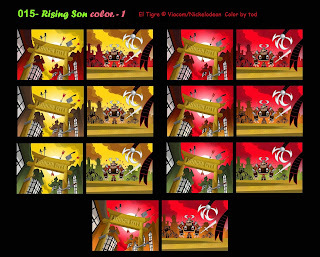 Every once in a while I'll dig through my archives and revisit color scripts from El Tigre: The Adventures of Manny Rivera. 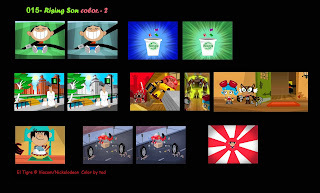 Though it has been a handful of years since the show was cancelled on Nickelodeon, I have to say it is still probably one of my favorite TV projects. 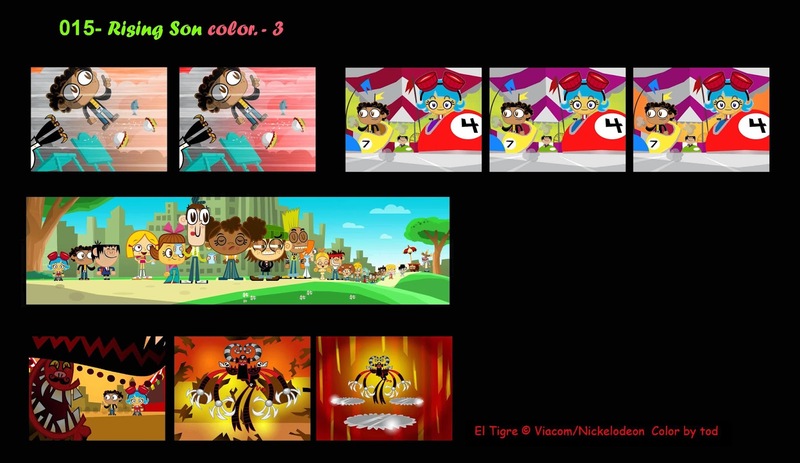 Creators Jorge Gutierrez and Sandra Equihua, art director Roman Laney, and director Dave Thomas tried to push every aspect of the show. For Rising Son I focused on contrasting a "clean" fresh look (note the rare blue skies) against the grit and grime of Miracle City. Some of the color variations are subtle. I had a good idea of what the creative leads on the show were looking for. But since we were on a pretty tight deadline, and I was working from Asia, I thought it would be better to give those variations and let the leads choose. To see more color scripts from the show please visit HERE.